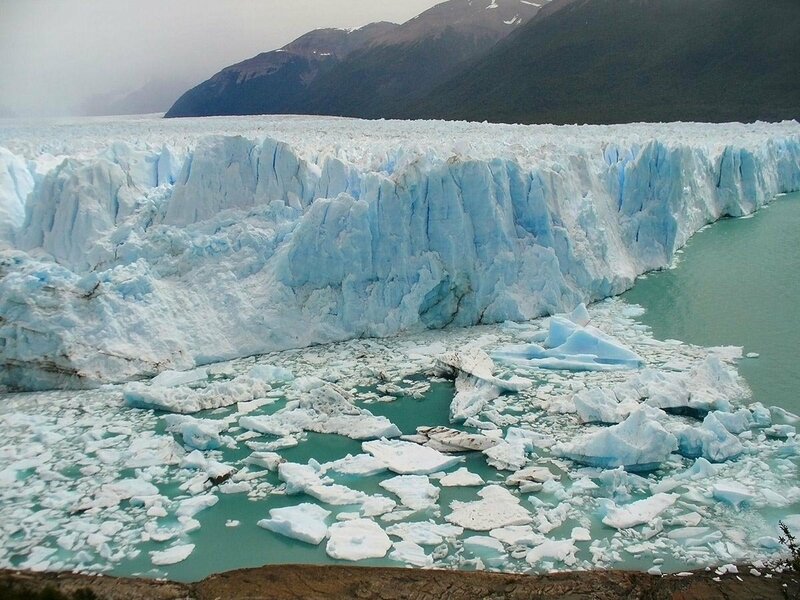 The Perito Moreno is of the few glaciers in the world actually growing and advancing, as opposed to the majority of the world’s glaciers, which are retreating and melting due to the effects of global warming. This means you’ll be witnessing one of the greatest survivors of the last ice age… a long-forgotten time when glaciers covered 30% of the world’s oceans and 32% of all land! 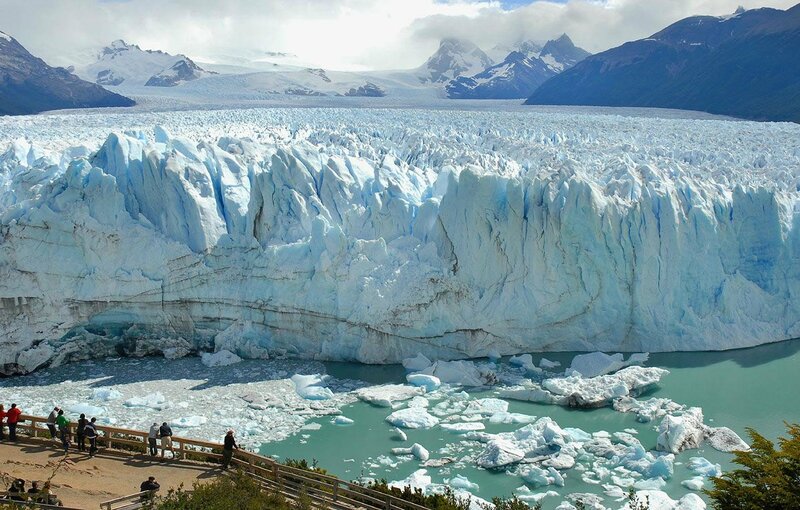 We’ll walk on the panoramic boardwalks, which overlook the Perito Moreno Glacier in all its glory. It’s here; amidst the backdrop of the majestic and snow-capped Andes Mountains, that you’ll find yourself immersed in an unforgettable glacier experience, all the while enjoying amazing picture-taking opportunities from the seven panoramic balconies facing the front of the glacier. These boardwalks range in distance from 460 to 2100 feet (140 to 640 meters). They are generally easy to access; the one exception is the southern balcony, which requires descending through a long path. This extra effort, however, will definitely be worth your time, because of the unique panoramic view of the Perito Moreno Glacier you’ll encounter once you get to the end of the boardwalk. The ice that serenely sits above the water measures an impressive 262 feet (80 meters), which is just about the height of a 25-story building! And while that’s an incredibly large size for the human eye to take in, consider that this measurement is only 15% of the glacier’s total height. Five times more ice is hidden underwater. 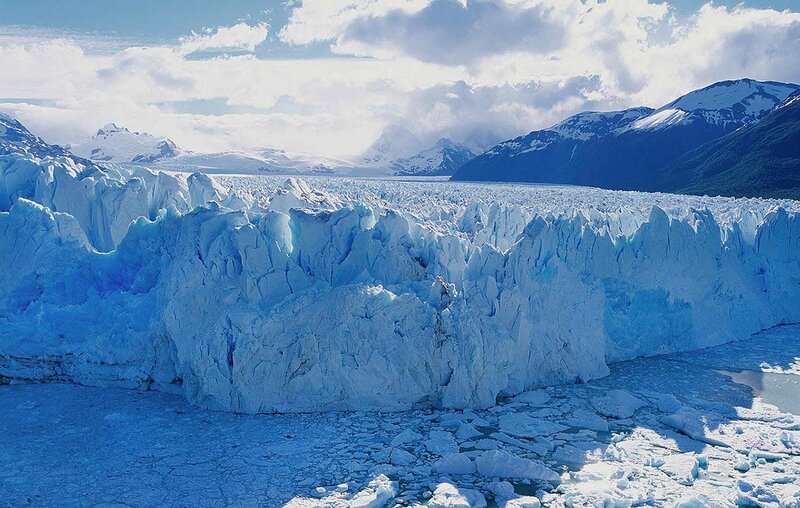 That means that Perito Moreno’s total height comes in at a massive 1834 feet (560 meters). Imagine a humongous ice skyscraper that reaches well past the Empire State Building, in New York City. Now that is truly a massive “chunk” of ice! 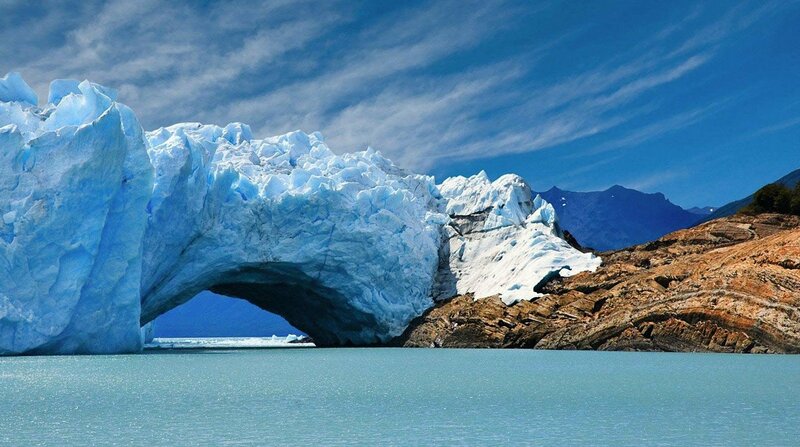 Our tour begins in the morning, with a one hour and thirty minute ride from your hotel to the panoramic boardwalks overlooking the Perito Moreno Glacier. The views you’ll take in here are definitely picturesque, so the ride itself might feel quite a bit shorter with all of the beautiful scenery to behold. During the trip to the panoramic boardwalks, we’ll be making one stop. It’s known as the “curva de los suspiros” (the “sighing” turn). 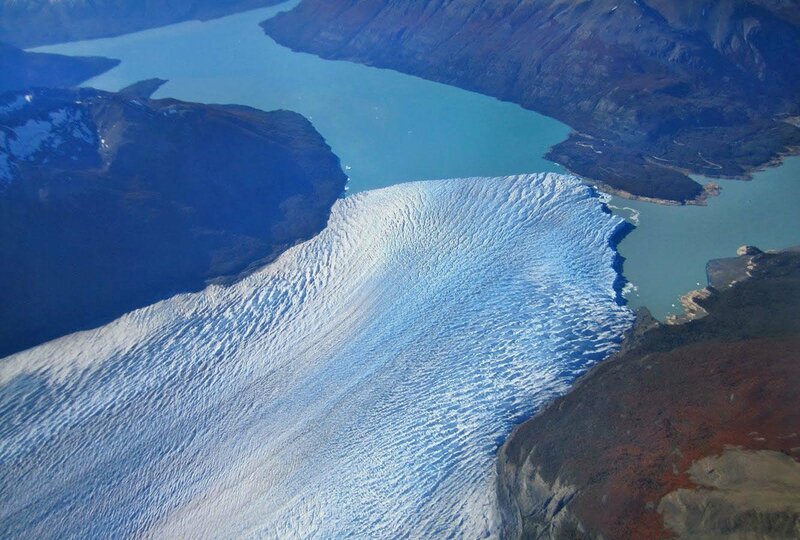 This is where we’ll be able to catch a first glimpse of the Perito Moreno Glacier, and then after the “sighing” turn, the glacier suddenly rears all of its bright white impressiveness, as if it’s finally revealing itself to us. 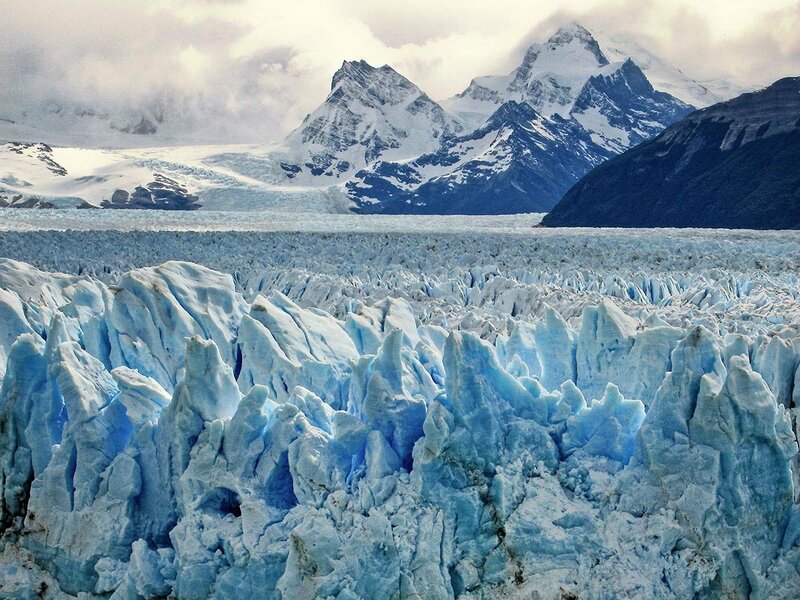 There are many nuances that make the Perito Moreno Glacier unique and picturesque; such as various cracks and shapes of ice, as well as the colors of the ice itself. Ranging in colors from white to dark blue, the various color tones are the results of different layers of ice being subjected to different levels of pressure. Scientists can actually determine the age of the ice by its color, similar to how a tree’s age can be told by counting its rings! If you get lucky, you may be able to witness the crackling noises from the ice as it begins to give way, and slide off the glacier into the water below, with an impressive crash. It’s an experience you won’t soon forget… and that’s only a small rupture! 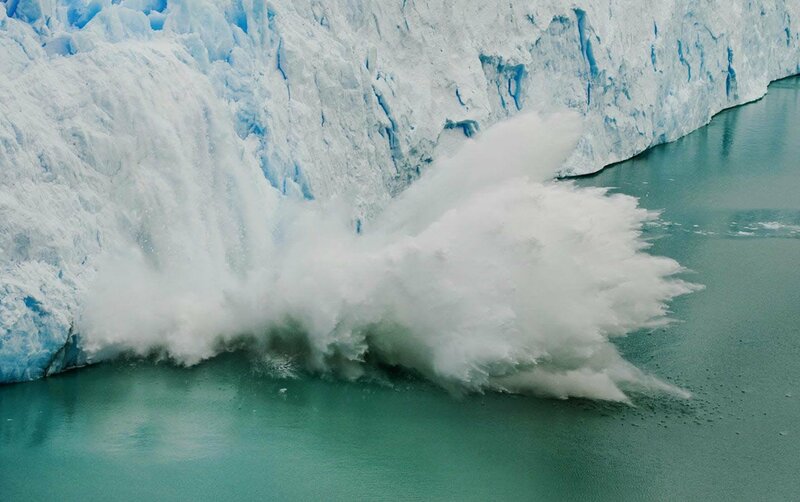 Larger, more forceful ruptures occur every two years or so, in a normal cycle of the moving ice. When a large rupture occurs, huge chunks of ice plummet down into water in a spectacular fashion creating a deafening, thunderous sound. The day will draw to an end with a relaxed drive back to the comfort of your hotel in El Calafate, knowing you have witnessed a unique natural wonder, which should be on anyone’s bucket list! Since you’ll be doing this tour with your own private vehicle and guide, you may stay longer at the panoramic boardwalks once the group tours return, enjoying the possibility of a more exclusive experience at this gorgeous location. You’ll also enjoy more convenient and faster transfers to and from, as there will be no other travelers to pick up or drop off at other hotels. Guide: private. Additional, for private transfers to the Glacier, the National Park authorities require a guide to go along with the travelers. Vehicle: private vehicle. Approximate traveled distance: 100 miles (160 kilometers).